Tinkle Razor Review 2019: How to Know Which One is The Real Thing? What Type of Hair Tinkle Razors Remove Best? Wait, what? You Can Use Tinkle Razors for The Whole Face? What’s The Hair Regrowth on Tinkle Razors? How to Use Tinkle Razors? What are The Advantages of Tinkle Razors? What are The Disadvantages of Tinkle Razors? Whether you’re a member of Brow Shavers United or someone who’s interested in trying out the latest skincare craze (face shaving), you’ve probably heard, read or seen others rave about Tinkle. Which probably led you to check out Tinkle razor reviews like this article. Perhaps you’re wondering if it’s for you and if it’s worth buying, fret not dears, this article will spill the real tea about this razor (the good, the bad and the ugly)! Tinkle razors are effective for both light to coarse hair. 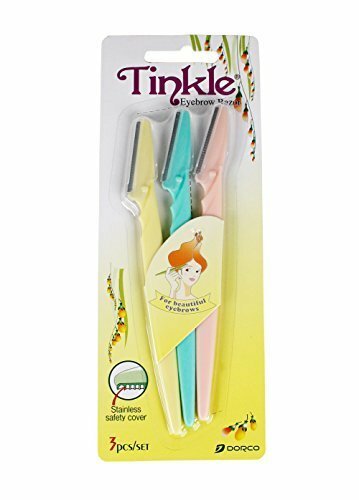 Being a pain wimp, I’ve been using Tinkle to painlessly groom my caterpillars, errr… my thick, dark eyebrows for years. But it was late last year when I learned that it’s great for something else – face shaving! Why? To remove fine facial hair and dead skin cells, or in a more scientific term, dermaplaning. Based on Tinkle razor reviews and my own experience, yes, you can! Dermaplaning is a great way to get rid of peach fuzz and dead skin cells, giving you bright and baby smooth skin in an instant! This allows your skin to absorb skincare care products more efficiently while offering a smooth canvass for makeup application. Sounds amazing, right? But, hold on to that razor! If you have the following, it might be best to reconsider dermaplaning or better yet, leave it to the experts. Dermaplaning works best for people with light facial hair, but for my brunette or dark-haired sisters, shaving our face might lead to darker-looking hair regrowth. Having dark facial hair myself, I noticed my hair is still as fine as before (I didn’t grow a beard, thank god!) although the edges were not as smooth as it was pre-shaving. This may differ from one person to another, so shave at your own risk. Best to hold off shaving until your skin is clear to avoid nicks which can aggravate your skin condition and cause infection (you don’t want to end up with a deep, nasty scar, do you?). To lessen the risk of injury, consult your local derma for a dermaplaning session instead. I will be honest with y’all, shaving the forehead area is not a breeze especially if you have fine lines as I do. No amount of pulling my skin taut makes my razor go over that area smoothly. It’s like shaving your knees, the ridges there make it susceptible to cuts, something I definitely don’t want on my face. Hair regrowth depends from one person to another. Some people have regrowth in two to three days while others take a good one to two weeks. Hormones also play a big role in how fast your hair grows back, as seen in women with PCOS. I personally shave my face once to twice a week as needed, like when I start to feel conscious at the first sight of regrowth. I do know people who do it every other week (lucky them!). Using a Tinkle razor is as easy as 1, 2, 3! Make sure your face is clean – No makeup, moisturizer nor sunscreen. You may use a facial oil to make the razor glide smoothly. Hold your skin taut– Skin needs to be stretched so you can get through all the nooks and crannies. Start shaving with a light hand using short, vertical strokes at a 45° angle –This ensures a closer shave and effective exfoliation sans ugly nicks. Make sure that the area is clean – Wash off any makeup or dirt. Mark your brows – I personally like marking my brows with a white eyeliner pencil. I place thin vertical lines over the following points where I want: the brow to begin, the arch, the eyebrow to end. I then place a bendy ruler on top of the arches and under to make sure they’re well aligned (yes, I’m meticulous when it comes to brows!). Start shaving with a light hand using short strokes at a 45° angle – You may shave horizontally, vertically and at a slant to effectively shape your eyebrows. If it’s your first time to shave your brows or if you have unstable hands, better leave it to a salon expert. This way you don’t revive the old Chola eyebrows trend or worse, start a new one (butchered brows)! Additional Tip: For sanitary purposes, I like wiping my razor with antibacterial wipes before and after shaving. I also change to a new razor after 3-4 uses. Painless and effective in removing unwanted facial hair and dead skin cells. Has a perfect angled head to groom and shape your brows effortlessly. Gives you a close shave compared to regular disposable razors. Protects sensitive skin with its stainless steel safety cover. Super affordable (you can even buy it in bulk!). Not get all the hair in one swipe (you might need to redo an area). Accidentally slip from your hand and chip a portion of your brow. Being the best razor for brows and dermaplaning, a lot of knock-offs have surfaced in the market. Some are listed under the name Twinkle, Tinckle, and Tinkle Rose. Keep in mind that the legit Tinkle is manufactured by the company, Dorco. It should state under its description that the razors were Korean made while the handles are made in Vietnam. You should also look closely at the razor – original ones have a stainless steel safety cover, fake ones don’t and are totally unsafe to be used in shaving. If you’re unsure but wanted to buy one, you can click on the link below. If you’re looking forward to trying Tinkle, this 3-pack is the perfect item to start with. Carrying the Dorco brand, you can be assured that you’ll get the finest and smoothest shave all the time. Razor made in Korea and handles made in Vietnam. Has a stainless steel safety cover to protect sensitive skin. Comes with a plastic blade cover to protect the blades (and you from the blades!). You might fall in love with it that the 3 -pack won’t be enough (you’d want more!). Tinkle is definitely an amazing product for the brows and the entire face. No wonder it’s been around for years and even duplicated by others (but can’t come close to the legit Tinkle’s quality). To ensure you’re getting the original product, always check the label, where it’s made, and look for the stainless steel safety cover. While shaving has lots to offer, let me tell you that it’s not for everyone and only you can gauge if it’s something you can do on your own or if you need to seek an expert’s help. A good example of that is my cousin who wanted to have this stylish “slash brow” trend. He was unsure and yet decided to DIY, he ended up shaving half of his brow, we had a good laugh for days. Have you tried Tinkle before? Or do you have a funny shaving story to share? I’d love to hear them! If you have any questions or comments, feel free to write them on the comments box below. Happy Tinklin’!